Cinnabar is no stranger to you (the player), although given the circumstances, it’d definitely be better if he was. This evil pirate murdered your parents without hesitation after all, leaving you with but one path ahead: one of vengeance. Time to roll the die and hopefully get some payback in this latest Fighting Fantasy book gone digital. 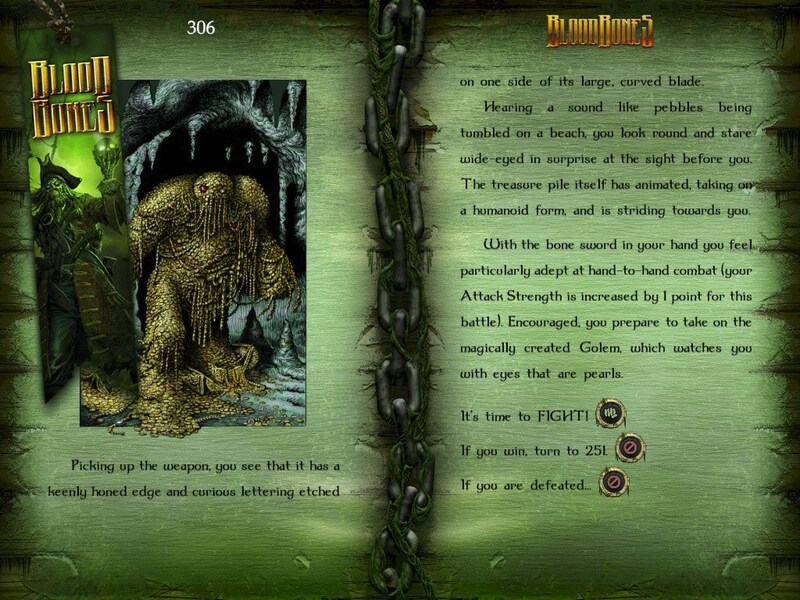 Like prior franchise entries, Fighting Fantasy: Bloodbones is a choose-your-own-adventure game in which you play the part of the hero, your every choice bringing potentially dire consequences: do you open that door up ahead, glance through the keyhole or simply leave it be, rather than tempt fate? Numerous decisions await – some fatal, some merely troublesome – and on top of that, there’s also… combat (hence the ‘fighting’ in Fighting Fantasy, ya know?). Fierce combat at that, with weapons fitting this particular setting and likely a handful of witty pirate banter to go along with it. Groovy. Now, as was the case with previous efforts, Tin Man Games have enhanced the gamebook somewhat from its black and white origins, colorizing the entire thing and adding brand new art (which can be turned off, for those who prefer the classic), among other things. Oh and there’s also a ‘cheat mode’, which lets ya do things like ‘page holding’, and of course, inventory management, stat tracking etc. is all handled automatically. Would be a tad finnicky otherwise. Trim the sails and roam the sea, something something Cinnabar was never a pirate meant to be. Take care of this plague upon mankind for good, voodoo magic or not, in… Fighting Fantasy: Bloodbones! Fighting Fantasy: Bloodbones is available for iOS (universal, iTunes) and Android (Google Play, Amazon), carrying a $5.99 price tag.